Nakhla Mix Ice Lemon Mint | HookahRev.com | Hookah, Simplified. 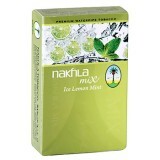 Good mint lemon is very natural and both are of good strength to compliment each other. Does not last long at all, almost complete flavor loss at 30 minute mark.